The Alerion Express 28 is one of the most beautiful 'Spirit of Tradition' yachts cruising and racing today. There really isn't a more exciting and just plain fun regatta than the Corinthian Classic Yacht Regatta, August 11th & 12th. Combine the two and you've got a WINNER! Ugotta do this Regatta! For 2018, all AE 28's will participate in a Pursuit Start based on their "OFFICIAL" CRF Rating. The CCYR will award Alerion 28 Class Trophies to the best performing AE 28's. Additionally, you'll also be eligible for hardware in the Spirit of Tradition (SoT) Division. You're a very good sailor and you're not afraid of goin' for the gusto, so make the Corinthian Classic Yacht Regatta the event of your season. Let's make a real race of it; tell other A28 owners. The more, the better. 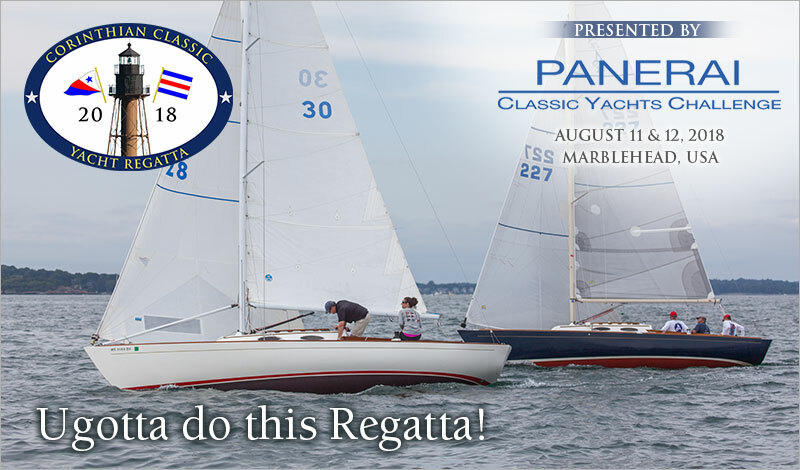 The 2018 Corinthian Classic Yacht Regatta presented by Officine Panerai, the title sponsor of the Panerai Classic Yacht Challenge Circuit, will be held August 11th & 12th. A new CRF MK II rating certificate is required for 2018. We will assist anyone without a rating to easily secure a certificate. A good regatta happens on and off the water and you can expect that the Corinthian Yacht Club along with Panerai will put on a good show. There will be a cocktail reception during registration Friday evening; cocktails, dinner, presentations and music on deck afterwards Saturday evening, and of course, more beverages and trophies after racing Sunday.